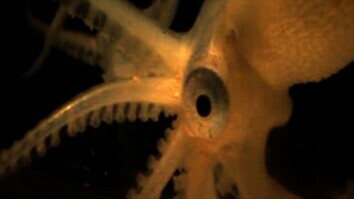 April 19, 2018 - This might or might not be a new species of squid. The crew from NOAA’s Okeanos Explorer filmed the unusual squid with their remote submarine, thousands of feet beneath the surface. At first it didn't look like a squid at all until the submarine moved closer and the animal rotated. 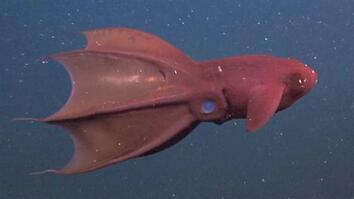 What stumped the scientists was the squid’s color, the position of its arms, and the posture on the ground. NOAA biologist and squid expert Mike Vecchione commented during the live feed: I wish I could tell you exactly what that is, but I'm gonna have to work on that a bit. There's a couple of different families that have these short bodied squids with very long fins, the *csychloteuthidae* is my current guess right now. 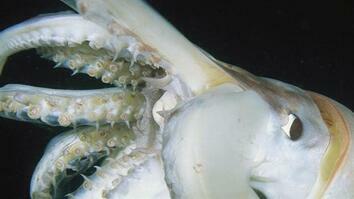 For now, biologists must speculate on the creature’s anatomy and behavior.